If you send me a full length LP, it's a guaranteed review out of me. Though honestly, if you send me most anything I'll eventually review it. (Though the dude in Buffalo that sent me 13 cassettes is probably going to have to wait a little bit for those.) When I received this Wooden Waves album in the mail, I had high hopes. The artwork made it look like the sort of playful indie rock record that I enjoy. Low and behold, I do enjoy it. Playful indie rock is a reasonably good description for Wooden Waves, but I can't help but feel it sounds somewhat dismissive of the band's songwriting chops. These are not throwaway novelty songs. Wooden Waves has gathered a very stong set of songs rooted in a sort of jumpy, 90's indie rock sound. Perhaps a more upbeat Silver Scooter with some early Jejune style of back and forth vocals? Maybe a slightly less fuzzy version of Tugboat Annie? Regardless of what touchstones you want to use, fact is, this is a pretty great record. One of my absolute favorite things about doing this dumb little website is discovering a new band thanks to someone else getting in touch with me. 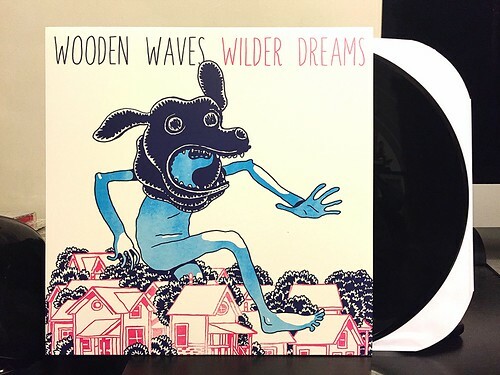 So thanks One Percent Press, you've made a new fan for Wooden Waves. Hopefully I can do the same for someone else reading this.